Three new Siwertell loaders will provide high capacity grain loading at the major Ukrainian port of Illichevsk with minimal environmental impact and exemplary levels of efficiency and safety. Cargotec has secured an important order to deliver three stationary Siwertell SBL 1600 shiploaders for installation at a grain terminal in the Ukrainian port of Illichevsk. The belt-type loaders, which are designed to handle vessels of up to 100,000dwt, each have a grain loading capacity of 2,000tph (tonnes per hour). It will be possible to use two loaders simultaneously to provide efficient, environmentally friendly grain loading services. Illichevsk Grain Port chose the Siwertell system because it represents an excellent technical solution at a reasonable price. “The system will be designed to minimize dust and eliminate spillages,” notes Jeppsson. The new loaders will be delivered in pre-assembled sections suitable for shipping. Delivery is scheduled for the end of 2014. The final mechanical construction work, electrical installation, testing and commissioning will be carried out on site under the supervision of Siwertell engineers. Cargotec offers a wide range of Siwertell grain handling products; loaders, unloaders and bulk terminal solutions. All of these are tailor-made to address customers’ particular needs and all offer exemplary levels of efficiency and safety with minimal environmental impact. 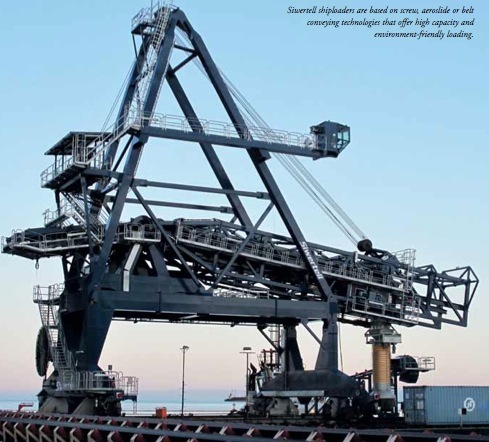 Siwertell ship unloaders and loaders are based on unique screw conveyor technology, in combination with belt conveyors and aeroslides, and can handle virtually any dry bulk cargo, such as coal, cement, fertilizer, agribulk, clinker, sulphur and grain. Siwertell plant and terminal design, ship unloaders, shiploaders, mobile ship unloaders, mechanical and pneumatic conveying systems, and storage solutions are all designed to ensure environmentally-friendly and efficient cargo operations.